A stunning 1-bedroom apartment with a balcony is available to rent in Evere, Brussels. The property is bright and beautiful, and it has a large living room with lots of space to relax and watch TV. The living room is open-plan with the kitchen. 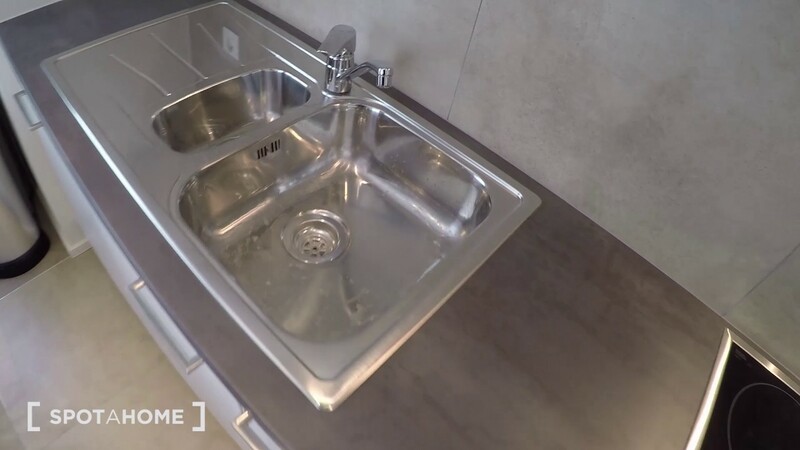 The kitchen is new and has everything you might need, including an oven, an electric stove, a dishwasher, a coffeemaker, a large fridge-freezer, a toaster, a kettle, and plenty of storage space. Off of the kitchen / living room, there is a sizeable balcony with a view of the street. The bedroom is large and cosy, and it has an ensuite shower room. In the hall, you will find the toilet room. Evere is a quiet, residential part of northern Brussels. Residential and tranquil, Evere is also well-connected to the city center by bus and tram. The toilet and shower rooms are divided, with the toilet room in the hall and an ensuite shower room. Convenient for couples or guests! The apartment has a separate laundry room with a washing machine and a dryer. There is a lovely balcony in the apartment. The apartment has been recently renovated, and all of the furnishings and appliances are brand new. The utility bills are not included in the rent price. The property is a short, 3-minute walk from the Fonson tram stop.